Place the carrots, onion and water in a blender and puree. Add the mangoes and puree until smooth. 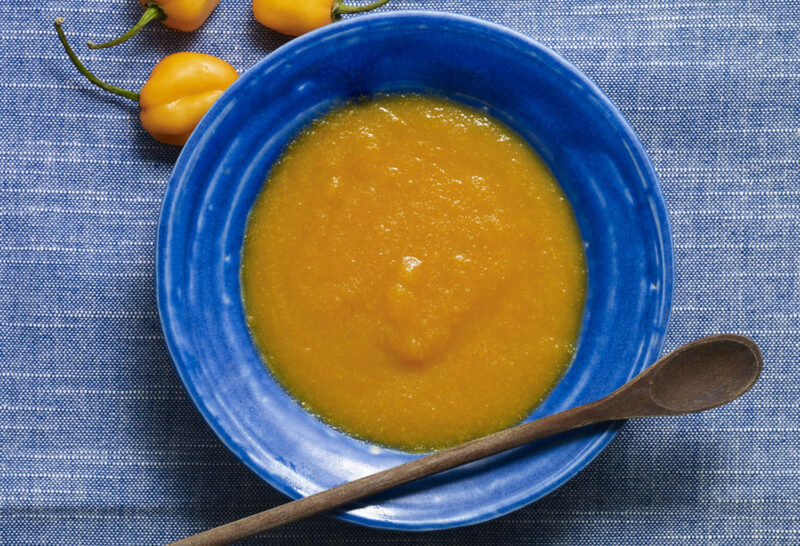 Carefully, adding one at a time, blend in the habaneros for one more minute until smooth. Pour the mixture into a large saucepan, add the vinegar, agave syrup and salt. Bring to a boil, reduce heat to low, cover partially with a lid and simmer until the sauce coats the back of a wooden spoon, about 30 minutes. Stir every 8 to 10 minutes to make sure doesn't stick to the bottom of the pan. This sauce combines two of my lifetime favorites. Mango and heat. I used to buy a commercial one but this one its so much better. I’m in love again! Thank you for sharing your love and passion for the kitchen. It sparks mine back. My daughters and I love doing your recipes. Yay! I’m so glad you are making your own now. if making a large batch can you use a canning method to save for a later time? Mine doesn’t last very long in my house…but yes give canning it a try! Yay! I hope you enjoy all of the recipes! Oh thank you so much for your comment Sylvia! I’m so happy to hear that you are inspired. What other dishes would you recommend this sauce with? Oh so many…other seafood, chicken wings…whatever you like! My husband came home with Habanero plants so as soon as they produce I’ll be making this. So happy you enjoyed it Marina! I just saw this episode right now and couldn’t resist to subscribe to your newsletter!!! Can you can this sauce & save for later use as a side to other dishes? It’s delicious. Hola Amber, The sauce is great on a range of dishes and it keeps for up to 1-2 weeks in a tightly sealed container in the fridge. Super happy to hear that Rosa!